Greetings from Friends Cafè. In Monrovia, CA! My favorite place to hang out on Friday nights. 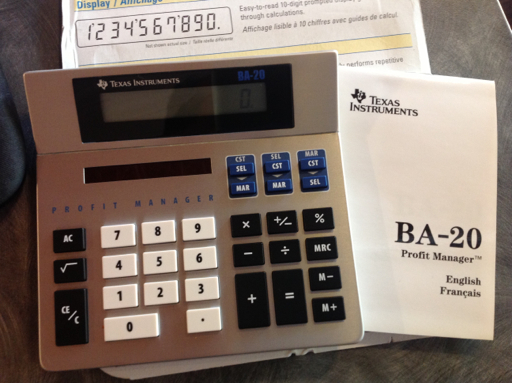 I doubt we see these in office stores anymore: the Texas Instruments BA-20 Profit Manager. I purchased this while visiting the Claremont Colleges Bookstore, after another visit to the Honnold/Mudd Library. 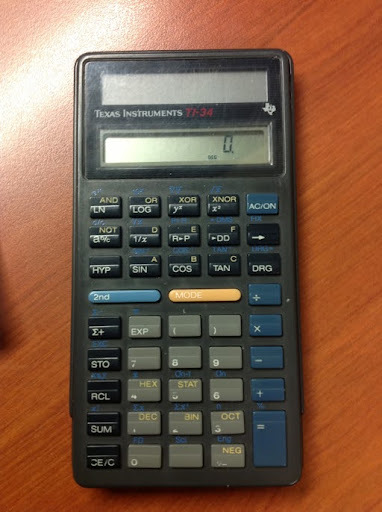 In what otherwise would be a desktop calculator, the BA-20 features Cost-Sell-Margin. 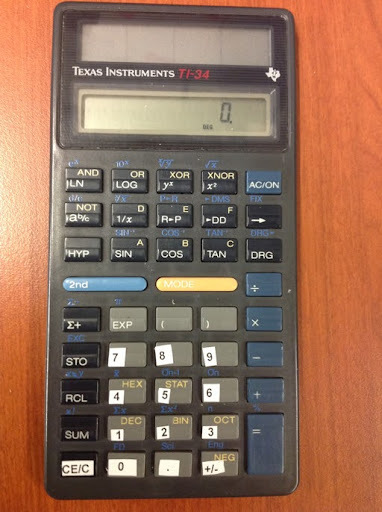 To get around the need for a "compute" key that TI's flagship business calculator, BA-II Plus, the BA-20 has three dedicated columns of two keys: two keys for entering known values, the third is calculated for automatically. Until next time, got to get to eating! Greetings from San Diego, am on vacation until Labor Day. 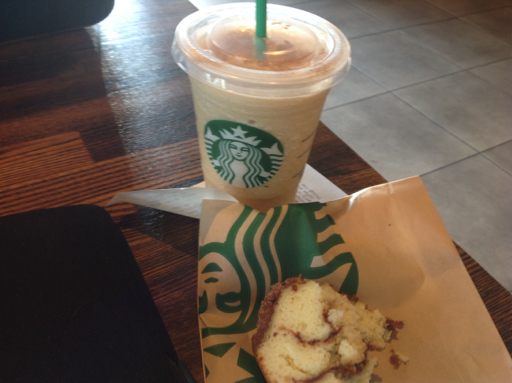 Specially I am at a Starbucks stop on my way to Encinitas Beach, enjoying a Chai Blended Latte. 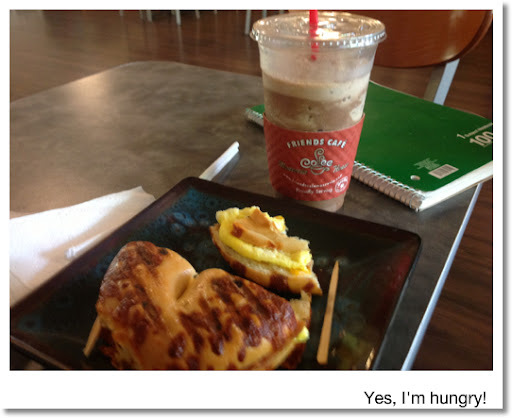 I just came from the Giesel Library at the University of California, San Diego. It took me forever to find it; along with the correct parking lot. The library is named after Theodore Seuss Giesel, better known as Dr. Seuss. Naturally, I managed to buy a Dr. Seuss book - my cousin's daughter is going to enjoy it, I'm sure. There is going to be Part 8 of the Differential Equation series, maybe more. I found an interesting way, maybe easier than Laplace Transforms or eigenvalues (the former I covered) to solve systems of differential equations. I am also aiming to do a blog on the Runge Kutta algorithm. Well, it's on to the beach for sunshine and sunset, and probably dinner. Have a great day everyone! Does √(3*x + 1) = -2 has a solution? (2) Subtract 1 from both sides and then divide by 3. That could be perfectly reasonable. After all, 3*1 + 1 = 4 and 4 = -2 * -2 = 2 * 2. However, use any calculator or mathematical software with solving capability, attempting to solve √(3*x + 1) = -2 will yield "No Solution". In practice, when we take square roots of numbers, we take the positive root, which is practical for majority of applications. The positive root is referred to the principal square root. That is what you get when you use the square root function on your calculator or mathematics software. 1. The principal square root function y = √x, plotted in red. 2. Solutions to the equation x^2 = y, allowing both roots. 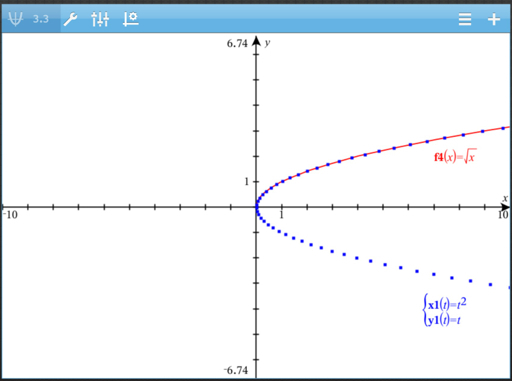 This is shown by the parametric equation, x = t^2, y = t, plotted in blue. So keep in mind, when dealing with roots with a calculator or software, you are dealing with the principal root. (If possible, real, then positive). In this blog we will look at how Laplace transforms assist us in solving systems of differential equations. For this, it would be best to show how to solve systems by example. In the last post, Differential Equations #5: An intro to Laplace Transforms, we introduced the concept of taking Laplace transforms and inverse Laplace transforms. The presence of f(0) and f'(0) indicates that can use appropriate conditions to solve the differential equation. 2. Solve for F(s). If necessary, use algebraic manipulation to get F(s) in a working form. In our examples, I am going to shorten F(s) to F.
In our next blog, we will look at how Laplace transforms will assist us in solving systems of differential equations. Thanks as always, comments and questions are welcomed! Laplace transforms is an integral transform that assists is in solving problems in physics, engineering, and differential equations. This section will introduce Laplace transforms, and we will see how they help in solving some differential equations in the next two sections. t and s are placeholder variables. Alternatively, we see x in place of t.
Often taking the inverse is more difficult. Sometimes algebraic manipulation is required to get F(s) into proper form for the inverse transformation. Practice, patience, and perhaps either a calculator with CAS capabilities or mathematical software are all useful tools for taking inverse Laplace transforms. Let's start with a simple inverse transform. Now that we had an introduction to Laplace transforms, we will use them to help solve differential equations. Until next time, Eddie! (2) Homogeneous: The equation is equal to 0. 2. Solve for λ. Let λ1 and λ2 be the roots of the polynomial. 3. The nature of λ1 and λ2 determines the nature of solution. The roots are distinct and real. On initial value problems, you are given y(x0) = y0 and y'(x1) = y1. You can solve for C1 and C2. There are also boundary value problems, in where you are given y(x0) = y0 and y(x1) = y1. Approach this like solving initial value problems, solve for y first, then solve for C1 and C2. The next time in the series, which will be in a week or so, we will spend several entries regarding the Laplace Transforms and how they can assist in solving differential equations. On this blog entry, we are going to go over a general procedure on how to solve these type of equations. The procedure requires a multiplicative factor called the integrating factor. 1. Calculate the integrating factor I = e^( ∫ p(x) dx). Since I' = d/dx ( ∫ p(x) dx) * e^( ∫ p(x) dx) = p(x) * e^( ∫ p(x) dx), I' = I * p(x). 4. Solve for y. If an initial condition is given, you can solve for C.
Let's work on some examples. The next time we will look at (simple) second-order differential equations, and how solving a quadratic equation helps solve the differential equations. Please leave comments and questions below. Here is where we start looking at differential equations that are more complex than y' = f(x). We will look at some techniques that can be used. Please note that no one technique will analytically solve all differential equations. Remember C is just an arbitrary constant. If we have initial conditions attached to the differential equation, then we can solve for C.
At this point, we may or may not be able to explicitly solve for y. The best way to tell whether a differential equation is separable is by practice and experience. Let's look at a few examples. y' is short notation for dy/dx (or dy/dt if the dependent variable is t). Solving for y, we get y = (x^3 + C/3)^(1/3). Solving for y, we get y = ln (e^x + C). The final answer is y = -1/(x^4/4 + 1/2). Simply put, a differential equation is an equation that involves an unknown function and it's derivatives. Your goal is to solve for the function. Students usually take a course in differential equations after finishing calculus. Ordinary differential equations involve unknown functions of only one variable. From above, equations (I) and (II) are ordinary differential equations. Partial differential equations involve unknown multi-variable functions. Examples include equations (III) and (IV). In this series, I will concentrate on ordinary differential equations. The order of a differential equation is determine by the largest-order derivative. All four equations, (I) through (IV), are differential equations of the first-order. y'' + 2*y' - 3*y = e^x. We are going to be begin with the most basic differential equation, dy/dx = f(x). where C is some constant. We'll talk about C later. There are far more complete tables in reference books or online. Differential equations may have additional conditions called initial conditions. Initial conditions give the value of the function (and it's derivatives - to order n-1) at some given point. Initial conditions given at x=0 is common. Initial conditions allow us to solve for the constant (C). With y(1)=0, substitute x=1 and y=0 and solve for C.
Our final answer is y = x^2 + 4*x - 5. Our final answer is y = e^(2*x) + 1. * The procedure is slightly different when it comes to using Laplace Transforms, which is later on in the series. Goal: Transform x^2 + a*x + b to (x + c)^2 + d.
Next I will use a technique that calculus students normally use when decomposing partial fractions. Hope this helps. Until next time! Not too long ago I purchased an original-style TI-34 from Amazon; the one with the single line display. I the one purchased was made in, if I am reading the date code correctly, in 1991. So it is the second edition of the TI-34, because it has blue arithmetic keys. The original, made in 1987, had red arithmetic keys. Today's TI-34, which is called TI-34 MultiView, we gain a multi-line screen, the ability to type calculations in textbook form, integer functions (absolute value, LCM, GCD, etc. ), two custom function programming, and linear regression. However, Boolean operations and base conversions are not available on the MultiView. OK, art expert I am not. Cutting small stickers are not my forte either. At least the numbers, decimal point, and the change sign key are readable again. The list of topics is subject to change. If you have suggestions, please let me know, always appreciate the feedback. Until next time, have a great day. School is just around the corner for many so enjoy the summer vacation while it lasts! For those of you in the Southern Hemisphere, hopefully the winter isn't being rough. Stay safe everyone!